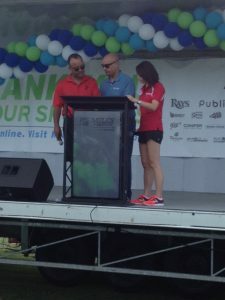 The 11th annual Miles for Moffitt race on Saturday, May 14th, was a smashing success. It was the second straight year I’ve run it, although last year it was an 8k and 5k, and this year they changed it to 10k and 5k. I snagged first place out of 31 in my age group. Over $500,000 was raised for cancer research, an amazing figure. 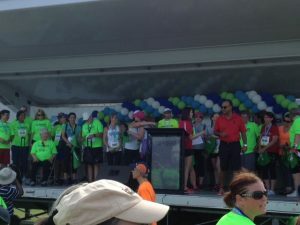 There was a moving post-race ceremony featuring cancer survivors on stage alongside Moffitt researchers, with accounts of the great treatment and care provided by Moffitt. 10News’ Reginald Roundtree and Dion Lim served as emcees. Cancer survivors and Moffitt researchers filled the stage. 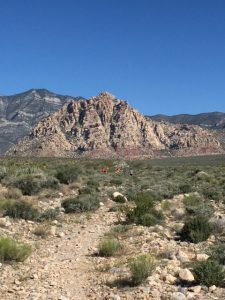 But if a mid-May 6.2-mile race in Florida seems daunting, consider the Flight for Fire 10k that my brother Gary ran the same day out in Red Rock Canyon, Nevada, near Las Vegas. A constant uphill over rocks in the desert made our efforts seem like a stroll in the park. I call it the Breaking Bad 10k.